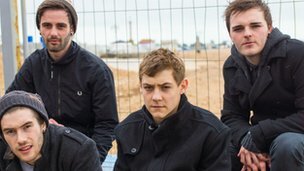 Founded in early 2011, this exciting, up-and-coming quartet from the heart of the Oxfordshire countryside have developed a highly unique Indie/Pop/Alternative sound with an ear for catchy melodies and feel good songs. Comprised of Joe Hamilton (vocals, guitar), Harry Elkington (vocals, guitar), Tom Sullivan (bass) and Tom Howard (drums), their songs are idiosyncratic and unusual, but also exuberant and uplifting, which makes for a compelling combination. Their name – which is the French for “dancing towards the beach” – is very fitting, aptly describing the jovial, feel good nature intoned in the songs. Interview by Jack Little (Mexico/UK) for The Ofi Press issue 48. It’s muso pop. Upbeat, feel-good, guitar pop with quirky musical tricks thrown in for good fun! 3. What has been your proudest moment so far as a band? There are loads of things we are really proud and to pick one out would be really difficult. Probably the fact that we are still together after 5 years! 4. How did you guys form the band? We formed the band at college on a music course under the name Midas Touch. Howard & Slice were in the same year, Harry & Sully the year below and it kind of all just fell into place from there really! 5. As well as making fabulous music, what other creative interests do you have? I think rolling is the only collective interest we have together other than music if you can class that as creative? Other than that we are all pretty individual when it comes to interests. Sully loves his cars, Harry his women, Howard is a pretty mean landscaper and Slice, well he just likes his beer. 6. To what extent do you guys lead a “rock and roll” lifestyle? 7. What next for Dance a la Plage? We took a year out to write and record a load of new material. We have a few tracks in the pipeline, whether that turns out to be an album or just an EP is unclear for now, however we think it’s the strongest material we have ever written and can’t wait to share it with people.